Foodservice utility carts are the backbone of your kitchen and hospitality transportation. Perfect for moving everything from tabletop items, to kitchen utensils, to ingredients, utility carts are the small equipment essential that will save you time, energy, and money. Utility carts are your go to solution for front of the house, back of the house, and off-premise catering jobs. 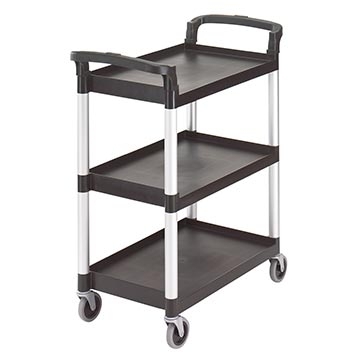 Just about anything you need moved; a utility cart is up to the task. They are engineered to carry heavy loads over rough terrain, and able to provide a wide variety of tasks. myBoelter has an excellent selection of durable and versatile utility carts that will make your next job, large or small, easier. Carlisle CC203603 Small Busing and Transport Cart - 18" x 36.5" x 38"